The Internet is abuzz with rumors about Android's upcoming version called KitKat. While no one knows what features will show up in this release, we've been busy preparing our own wish list for Android 4.4. Let's hope Google includes these features in the new release. iOS7 was a milestone release for Apple as not only did it introduce a new UI, it also made sure that users stuck with an older iPhone won't go home disappointed. To end its fragmentation woes, we expect Google to do something similar with Android 4.4. They could release a trimmed-down, highly compatible operating system that works across older devices thus making sure that fragmentation issues stop bugging Android's growth. Though Android is already breezy as it is, especially with the new TRIM updates in 4.3, there is a lot more that can be done when it comes to speed. We are sure Google has done a lot of tweaking under the hood to make Android faster than ever before. Last time Android was released, two new pure Android devices were announced. 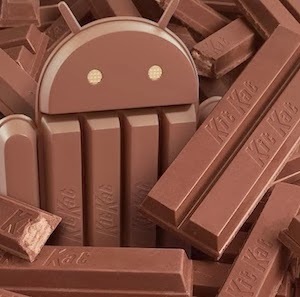 This time too, we expect more Android devices to be released that give us a pure KitKat experience on a powerful device. How about a Galaxy Note 3 running Android 4.4? Pure Android isn't particularly known for its camera application. Samsung and HTC both have done a good job in providing a solid camera application that makes full use of the hardware. We expect our beloved Google to surprise us in the photography department with its Nexus 5. NFC has been present in Nexus devices for years; however, there haven't been any software innovations that make full use of the technology. We expect Google to pack something into the OS that makes full use of NFC to provide something useful and remarkable. Though apps like Google Plus are benchmarks of what Android's newly set design standards can do, applications like Hangouts seem relatively half-baked. Google can make sure that all the applications, especially the default ones are up to the high standards the company has set post Ice Cream Sandwich. Hangouts, for example seems even more buggy and confusing than its predecessor Google Talk. In 4.4 at least, we expect them to tie in SMS with Hangouts. Though the pattern-based screen unlocking has always been one of the best security methods, it can still be improved to make things more accessible. For example, using a particular pattern you can directly access certain apps. In fact, not so long ago Google did file for a patent for custom patterns that make you do specific functions. Though Android's latest version comes with lock screen widgets and notifications, the feature seems rather half-baked and incomplete. A good way to improve upon it is by using DashClock widgets, which makes full use of the new feature. If only Google can bring the same features as DashClock does to the default KitKat, it would be a treat for the users. Moto X is a beast of a smartphone from Motorola that comes with a lot of interesting features. One of its biggest USPs is that it comes with hands-free voice activation. In other words, if you talk to your phone even when it's on standby, it talks back to you and gives you the relevant information. If only Google brings the same feature to Android 4.4, it would be an amazing thing. Imagine keeping your phone within an arm's reach and saying "Okay Google, How's the weather today?" We expect Google to make changes to the UI so that it looks even better. Though Android fans love the look of the vanilla Android, there is a lot of room for improvement. Also, since the release of iOS7, the mobile battle has reached a whole new level thus giving Google enough motivation to step up their game.